The tools developed in collaboration with Prof. Tiziano Testori allow a precise, gentle and safe tissue separation for a predictable surgery based on scientific evidence. The first tool, TT1, is used to find the cleavage plane between the sinus membrane and the bone base, whereas tools TT2 and TT3 allow an easy separation in a mesial/distal and vestibular/palatal direction. The carrier tool, along with a compactor TT4, allows an easy positioning of graft material. 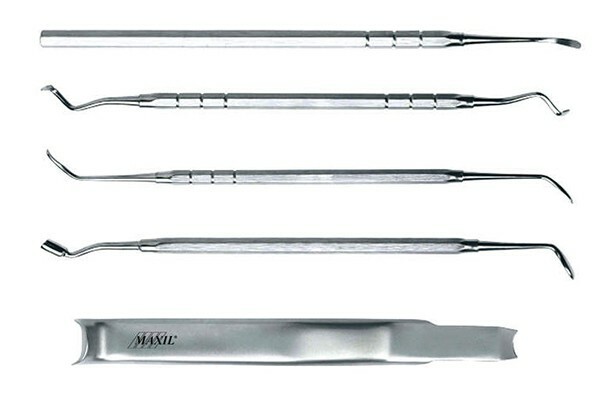 The retractor TT5, which is anatomically shaped to follow maxilla morphology, makes surgical access easier.